Trail in excellent condition with good signage. Snow free with just a couple of small patches near Buckhorn Pass and on the way to Buckhorn Peak that will be melted soon. We started at 9:30AM on July 1 (Saturday) and there was still room for a few more cars in the parking lot. We made quick progress on the fairly flat forested trail to the Copper Creek crossing (rhody blooming essentially done, unfortunately). Copper Creek required wading for prudence at this point though some hopped some sketchy moss covered rocks. We had lunch and gathered up water at the creek for the night and next morning, then walked up to Buckhorn Pass on the well graded trail. Wildflowers are at their most amazing peak with many colors. 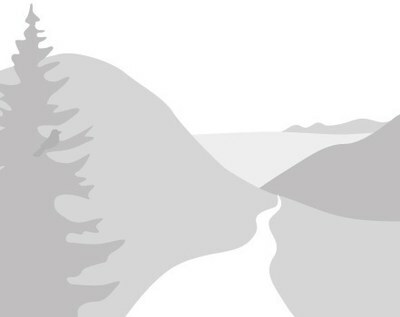 We camped in the basin below Buckhorn Pass near the trees (lots of camping space here, but no water source other than melting snow) and set up our kitchen/dining area at the pass with fantastic views to the Olympic range across the Dungeness valley. After setting up camp we climbed the ridge and up to Buckhorn Peak (some snowfields that can be easily skirted but this is a very steep and slippery scree climb in places). 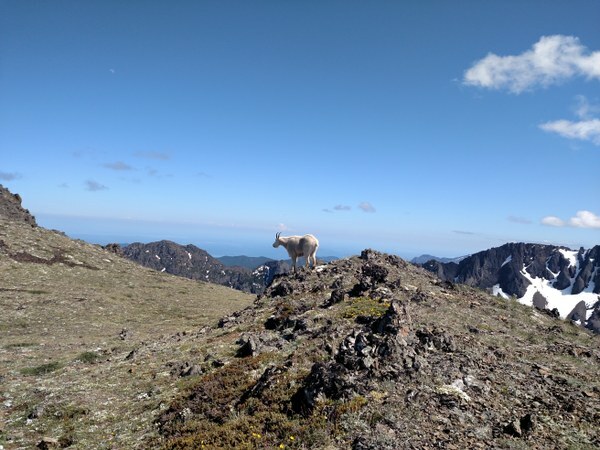 There were a dozen or so goats along the trail to the peak, and views stretch from the Hood Canal to Mt Baker and the Strait of Juan de Fuca to the snowy Olympic range. In the evening a raucous group of about 20 people arrived and set up their 8 tents on the pass, though they were courteous enough to leave us our dining area. After a calm dry night we started early to climb up the two unnamed peaks to the north, very fun and very pretty. Then we gathered up at 10:30AM to make our way back down. Crowds were making their way up, for dayhiking or to stay at Buckhorn Lake. My advice: don't go to the lake, carry the water up to the Pass - it's worth it! Not much of a view from the forested lake. On a warm day it would be good to carry at least 5 liters up to the dry camp.